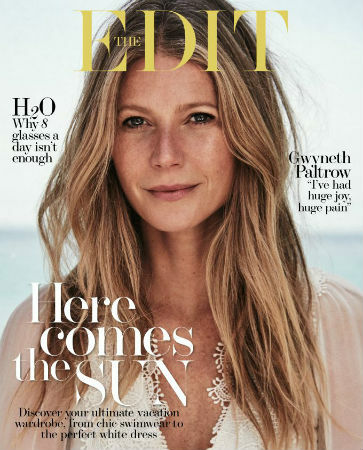 -I really like the tanned, no makeup thing Gwyneth Paltrow has going on on The Edit cover. The interview is predictably eyeroll-y though, in which she acknowledges that the phrase “conscious uncoupling” is “dorky” but still “a good idea.” She really loses me when she blames the backlash against GOOP on “stay in your lane” sexism, saying “Women in general get a lot of pushback, especially if you’re successful and attractive.” Maybe the pushback had less to do with how beautiful she is, and more to do with the fact that she told women to steam their vaginas? -HBO nabbed Julia Roberts‘ first TV series, Today Will Be Different, based on the Maria Semple book. -The new Arcade Fire song “Everything Now” I mentioned yesterday is out with links that aren’t disappearing! It’s got an ABBA vibe that I can get behind. -People has released a statement in response to Jennifer Garner’s clapback, saying “Our story on Jennifer Garner is fair and truthful. To be clear, it does not include rumors and does not say she’s pregnant. We wish her well.” It’ll be interesting to see how this shakes out, as she was clearly pro-People when it came to exclusives before this. -Netflix has cancelled Sense8 after only two seasons. Probably not great timing that they killed such an LGBT-positive show on the first day of Pride. -Variety points out a disturbing trend in the recent TV cancellations: they’re often inclusive, diverse shows. –Jennifer Hudson, Aubrey Plaza, Adam Scott, Kal Penn, Joseph Fiennes, and Rose Byrne are among the 30 supporting TV actors who posed for this giant Emmy photo. –Riz Ahmed, Ewan McGregor, Billy Bob Thornton, Sterling K. Brown, John Lithgow and Jeffrey Wright take part in THR’s TV drama actor roundtable. –Chloë Grace Moretz apologized for her new animated movie’s terrible, body-shaming ad, tweeting “I have now fully reviewed the mkting for Red Shoes, I am just as appalled and angry as everyone else, this wasn’t approved by me or my team. Pls know I have let the producers of the film know. I lent my voice to a beautiful script that I hope you will all see in its entirety.” I dunno, the trailer seems pretty bad, too. -Wonder Woman — earning rapturous reviews — is expected to chase away the doldrums at the early summer box office with a $95M debut this weekend. -Meanwhile, the studios are blaming critics for the soft Memorial Day weekend. Lolz. -The mayor of Austin just shut down a sexist email about women-only Wonder Woman screenings and it’s everything. –Chris Pine says he spent the Wonder Woman shoot “flirting and acting like a jackass.” Which pretty much sounds like typical actor behavior but at least he’s admitting it. -I love this season of The Leftovers. I don’t understand it, but I love it. The thing I find really interesting is how it’s engaging directly with TV critics. A recent episode was inspired by the death of Vulture critic Matt Zoller Seitz’s wife. Creator Damon Lindelof also admitted that they wrote season two and three’s long opening sequences to mess with critic Andy Greenwald. And now Variety’s Mo Ryan has written a heartrending personal essay about experiencing the loss of her parents through the lens of the show, and it left me in tears. -This is Us creator Dan Fogelman has written an ode to broadcast network TV. –Leonardo DiCaprio, Josh Gad, Katy Perry, Ashley Judd and more celebs took to Twitter to slam Trump for pulling out of the Paris climate accord. -Here the first trailer for Kenneth Branagh‘s Murder on the Orient Express, featuring Penélope Cruz, Willem Dafoe, Judi Dench, Josh Gad, Leslie Odom, Jr., Michelle Pfeiffer, Daisy Ridley, and some really pretty tracking shots.